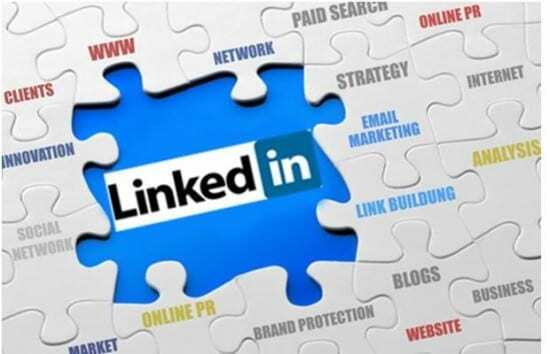 LinkedIn started in 2002 as a personal profile space where professionals could share their expertise, experience and connections. Some people naturally wanted to showcase their business and wrongly used the personal profile as a business profile. To address this need, LinkedIn created Company pages and September 2012 has seen an update in the look of company pages which more closely mirrors the Facebook company page, with a cover image at the top of the page, logo and company name above this (rather than below as on Facebook), followed by the latest news feed. Remember that the Company Activity status updates were introduced in October 2011 - are you using them yet if you're in B2B. Right now the new design is available to a limited number of companies. It seems to be those that advertise careers via LinkedIn and later this year it will be rolled out to all companies. However, many companies are not yet harnessing the old style page. The following guide will give you tips and advice on how to make the most of the tools available, and show you examples of some of the best uses of these tools by UK companies. Less than a year old, the Status Updates feature added to the Company Pages is another element of search engine optimisation, creating content about your business on a trusted third-party space with the ability to create relevant links back to your website. So why have so few companies got on board? Unlike using RSS Feeds, News Modules, etc, adding content as a company status update not only populates your page, it also delivers your content to your followers’ news feeds. Fresh content on your company page can encourage new and retain existing followers. It adds to the keywords used in your business and as LinkedIn is becoming the largest company database, this adds to the opportunity to be found online. 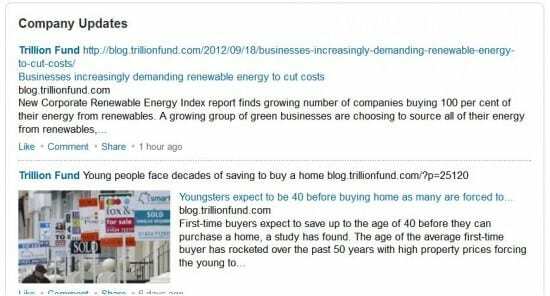 Trillion Fund, a UK company which provides funding for new renewable energy sources, have utilised this feature well by posting regular links to news stories and their own blog posts. The challenge is that only admins can post updates and the admins must be employees of the company (i.e. noted on LinkedIn as connected to the company). Businesses outsourcing their PR cannot designate admins as ‘content creator’ which is available on Facebook. The next page requests the Company name and your email address at company – this is usually an email address associated with the company’s domain name. You also need to verify that you are the official representative of this company and have the right to act on behalf of your company in the creation of this page. This is to stop fake company pages appearing. If you have a company page but have not yet added content, it’s worth ensuring each element is completed. You can add your company logo as well as a square logo (50x50 pixels) which is used in the network updates. When ready, you select ‘publish’ and the information is instantly online, so ensure you have all the information available when you are ready to go ahead. LinkedIn company pages are built to promote your company and what you offer, which is why LinkedIn enables this tab once you’ve added a product or service. The Products/Services Tab makes it easier for visitors to see a breakdown of all the products and services you offer, as well as any marketing offers you are currently running such as free trials and tester products, webinars and events, etc. But be sure to keep up to date if you include offers, so that out of date offers aren’t left to clutter the tab. Step 4. Add an image of your product or service. This should be 100x80 pixels. Step 6. List of key features – this is a bulleted list, think about using your key words and phrases. Up to 10 features are allowed. Step 7. Add a URL for this product or service. This is useful and means you can direct traffic to specific landing pages. Step 8. Add a contact from your company. This can be your sales team or other staff members but they must be on LinkedIn, connected to your company and linked directly to you as the admin. Step 9. Add a promotion for this product or service. If you have a promotion or special offer for this product or service you can add more details here. Step 10. Add a YouTube video about this product or service. If you have a YouTube video about this product you can add a title for your video here. Step 11. Add your YouTube video URL. This is a simple copy and paste of the URL from your YouTube video. Reviews and recommendations are now needed everywhere. From Google Maps and Facebook Likes to TripAdvisor and now LinkedIn. LinkedIn established personal recommendations at an early stage. There is now a facility to add to individual products and services. The challenge is that it’s much harder to acquire recommendations on products and services on LinkedIn company pages. 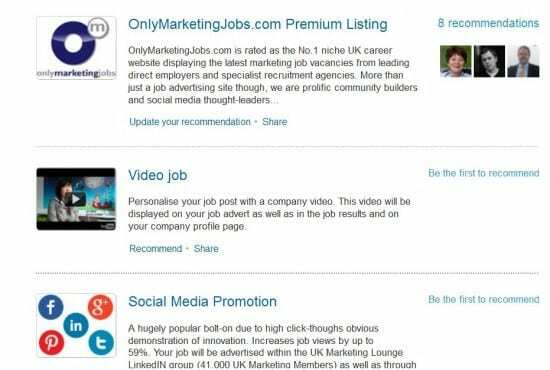 Only Marketing Jobs has a Group on LinkedIn with over 40,000 UK members, yet only 8 recommendations for its main service. And Marks and Spencer, with over 20,000 followers to its page doesn’t bother to list a single product or service. If you’re not happy with a recommendation you can now Comment, Flag or Delete. 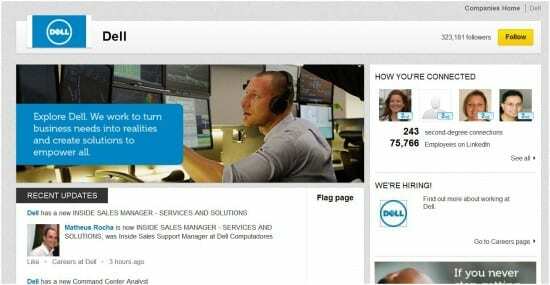 Those with paid subscriptions can add Careers and advertise jobs via LinkedIn. All jobs promoted via LinkedIn automatically appear in this section. Promoting careers is the main way LinkedIn generates its income. It is a more focused way to attract candidates with the qualifications and background a company requires. This is part of the power of LinkedIn. It connects all those working for the company in this one place. This can be seen by anyone viewing your company page and they can also see how they’re connected to your staff and the degrees of separation. This provides fairly limited demographic information. You cannot remove followers and equally followers are public, not anonymous. It shows who is looking at your page and their generic backgrounds. You can also follow other companies – as mentioned before – this is not anonymous and can be viewed by anyone looking at the followers. LinkedIn is clearly establishing itself as the place for business. I feel that the new Company Pages mimic Facebook, and clearly there’s a war on content (where to include it) and places to be visible (where to be). LinkedIn is a powerful B2B marketing tool, used well, with four out of five UK professionals on the network. A good LinkedIn company page is a satellite website, but don’t forget, it’s owned by LinkedIn – not your business – so ensure that all traffic is always directed back to your owned media. Have you organised your Company page yet? If so we'd love to see examples. Share here so we can follow your updates too.